Here is my third (out of four) glass fleck duochrome top coats that I frankened. 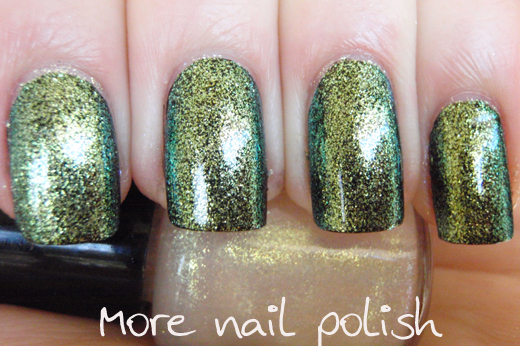 This one is gold shifting through to green and is two coats applied over black. 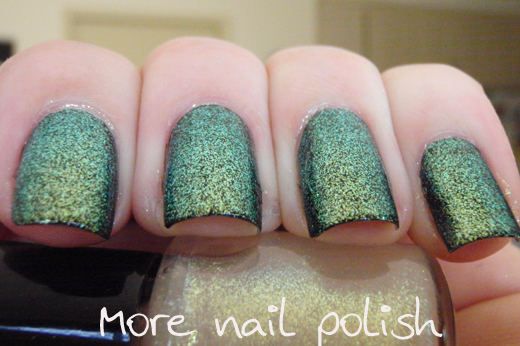 Macro shot showing the glass fleck and the green duochrome on the nail edges. In the sun, very reflective and shiny. 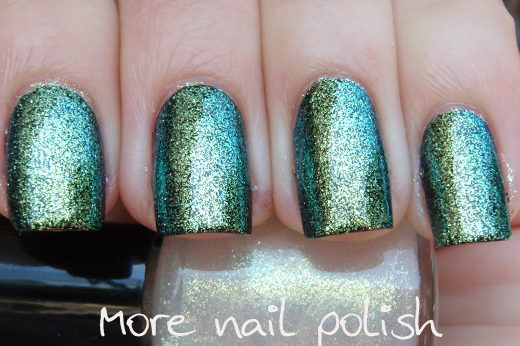 Now another comparison to an Orly Cosmic FX polish, It's Not Rocket Science. 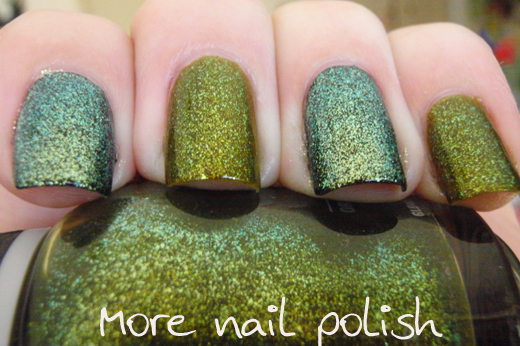 Of course the base colours are nothing alike, but the actual glass flecks in the polish are the same. You can see the shift of the flakes in the bottle and how they match the shift in the franken. I could totally franken a pimped out version of this polish, but the truth is, the base colour of this isn't one of my favourites, so I would much rather wear this as a top coat. 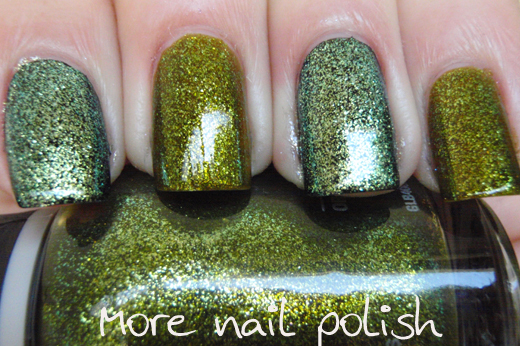 Only one more day to wait and I will tell you where you can get these three glass fleck pigments from. 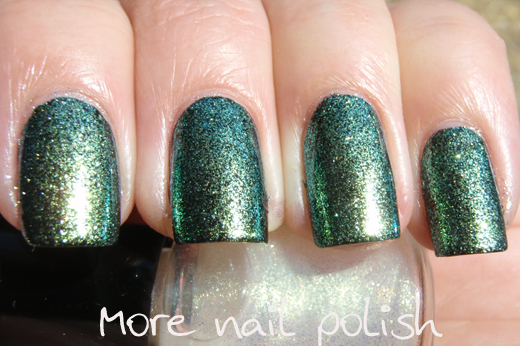 Başak - I don't have any of the CND sparkles, I'm gonna have to check them out. Você é a rainha dos Frankens . It's gorgeous and it's green! Stunning. OMG! Wow! Stunning! I want it so bad. If you ever want to get rid of it, send it my way! It looks beyond amazing! 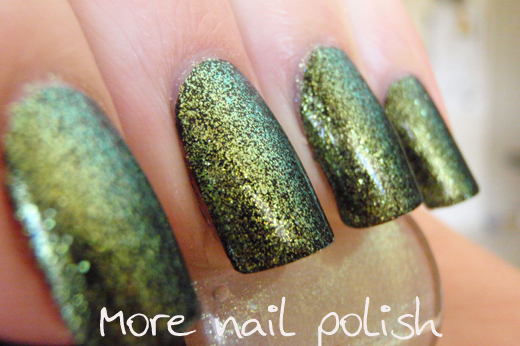 With the colors of green it shifts to it reminds me of Chanel Peridot! But better :D You're a frankening god haha!